As we commemorate Black History Month and celebrate the many contributions of African Americans like Benjamin Banneker, Clarence Mitchell Jr., Frederick Douglass, Harriet Tubman, Josiah Henson, Matthew Henson and Thurgood Marshall, it is a time to reflect on Maryland’s past as well as the Free State’s future. It is a complex story to say the least (one that sadly includes both segregation and slavery) but it is a story worth knowing and understanding. And people are coming here to learn that story on Maryland’s Lower Eastern Shore. 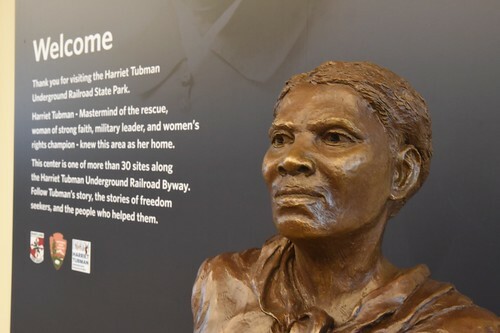 I’m proud to report that a record number of guests – 100,000 from all 50 states and 68 countries worldwide – have visited our new Harriet Tubman Underground Railroad State Park and Visitor Center in Dorchester County. This magnificent 17-acre facility in Church Creek celebrates its anniversary on Harriet Tubman Day, March 10, and will play host to a number of events and programs during Black History Month and beyond. One of the immersive experiences at Harriet Tubman Underground Railroad State Park is learning about the landscape of the Eastern Shore during Tubman’s lifetime and how it was an integral part of the Underground Railroad for those shedding the shackles of slavery and seeking salvation and freedom. Visitors learn how Tubman’s early years in the Choptank River region taught her the skills necessary to become one of the most celebrated and successful conductors (one who never lost a passenger), and later a Civil War hero and suffragette. Also this month, we will join our partners at the Audubon Naturalist Society for their “Taking Nature Black” Conference Feb. 28 in Chevy Chase. This signature event is designed to highlight the role that African Americans play in enhancing and protecting our shared communities, environment and natural resources. The conference attracts students as well as new and seasoned professionals in “green” fields and will include a job fair. Deputy Secretary Joanne Throwe will join the distinguished guests to discuss the department’s new diversity plan and workforce development, skills and training program, Work2Live WELL, which will soon be recruiting qualified applicants in Baltimore City and Cambridge.